Kevan Kilistoff scored the winning goal at 5:44 of the first overtime period to lift the Surrey Eagles to a 2-1 win over the Penticton Vees in Game 5 of the Fred Page Cup Final on Thursday night at the South Surrey Arena. The victory gives the Birds a 3-2 lead in the series. The first period was a hard fought defensive battle. Both teams had a handful of chances but played well in their respective zones, limiting the number of high quality opportunities. It looked like the teams would head to the dressing rooms scoreless, but Penticton got on the board first with less than three seconds remaining in the frame when Cam Amantea forced a turnover on the end boards and fed in front to Travis Blanleil who netted his sixth of the playoffs. The pace picked up in the middle frame and both teams had good chances to score. Penticton's best opportunity came on the power play when Michael Rebry tipped a shot on net that got past Michael Santaguida, but the Surrey goalie dove back in the crease and knocked the loose puck away before it crossed the line. Late in the frame, the Eagles had a flurry of chances in the Penticton end but couldn't find an equalizer. Surrey tied the game just after the five minute mark of the third when Matt Dawson, who had just come out of the penalty box, received a pass at centre and sent a long shot just wide of the net. Trevor Cameron beat goaltender Chad Katunar to the loose puck and scored on a wraparound into the wide open cage to even the score. The Vees had some wonderful chances later in the period to retake the lead but couldn't ripple the mesh. John Siemer caught Santaguida out of the net and nearly scored into an open cage as well but fired the puck across the goal line and out the far side. Colton Mackie nearly netted the winner for Surrey in OT when he was denied by Katunar in close after a nice pass from behind the net by Michael Stenerson. 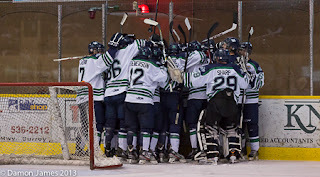 Eventually, Kilistoff found the back of the net after Craig Wyszomirski's point shot bounced off the end boards and back in front to the Langley native who chipped the puck past Katunar to give the Eagles the win. Neither team scored on the power play as both teams went 0-for-4. The shots were even between the two sides at 30-30. Surrey improves its playoff overtime record to 4-0 with the win while the Vees are now 2-2. The Eagles will have a chance to capture their fourth Fred Page Cup in Game 6 on Sunday at the South Okanagan Events Centre. Face-off is at 5:00pm.